Spring brings heavy rains. Storm-Water runoff can inflict damage on you home or business. Standing watercan damage foundations, side-walks, and driveways. It can deteriorate anything made of concrete or cement. CMG Sprinklers and Drains can help protect your investment. We can quickly diagnose your Drainage Problems and provide a Free Estimate. CMG utilizes a variety of Drains to Solve a variety of Drainage Problems. CMG Drainage Systems are made up of one or a combination of: French Drains, Surface Drains, Channel Drains, Basement Drains, Trench Drains, Basin Drains, and Sump Pumps. This gives us the flexibility needed to handle a variety of home or business Drainage Problems. Along with Drainage System Installation, CMG has over 17 years of experience with Lawn Sprinkler Installation and Sprinkler Repair. We also install Rain/Freeze Sensors for existing and new Sprinkler Systems. Sprinkler Systems installed by CMG are automatic and self draining. We install in-line drains in our Sprinkler Pipes to ensure that there is no water in the Sprinkler System to freeze during winter. This gives our customers additional piece of mind and increases Sprinkler System Longevity. Oklahoma is famous for it’s powerful thunderstorms and heavy downpours. Storm-water runoff causes a variety of DRAINAGE PROBLEMS for Home and Business owners. DRAINAGE PROBLEMS come in a wide variety of forms. You might have water standing in your backyard after a thunderstorm. Water from your gutter-downspouts may be turning your sidewalk into a “Moat.” Or, worst of all, Standing Water may be seeping into your home. CMG can help! Drainage solutions sometime require one or several types of drains to solve the problem. CMG Sprinklers and Drains has been successfully solving DRAINAGE PROBLEMS since 1993. We can quickly diagnose your DRAINAGE PROBLEM and design a DRAINAGE SYSTEM to solve yourDRAINAGE PROBLEMS. WE UTILIZE: FRENCH DRAINS, SURFACE DRAINS, CHANNEL DRAINS, BASIN DRAINS, TRENCH DRAINS, BASEMENT DRAINS, AND SUMP PUMPS. CMG can also fill all your Lawn Sprinkler Installation and Sprinkler System Repair needs. We have Installed or serviced over 4000 Lawn Irrigation Systems since we opened for business. For those of you who already have a lawn sprinkler system, CHECK OUT A RAIN FREEZE SENSOR! If it is too cold the rain/freeze sensor will automatically turn off your sprinkler system if you forget. If a thunder storm occurs while you are out of town, no worries, the rain/freeze sensor will keep your sprinkler system from running during a down-pour! Rain/Freeze sensors are great for sprinkler systems located at business. Many times there is no one available after hours or on weekends to turn off the sprinkler system. I have seen sprinkler systems running after a snow or ice storms. (usually a bank) I always smile! CMG Sprinklers and Drains services CENTRAL OKLAHOMA INCLUDING: NORMAN, MOORE, EDMOND, MIDWEST CITY, DEL CITY, YUKON, MUSTANG, OKLAHOMA CITY, BLANCHARD,AND PURCELL. 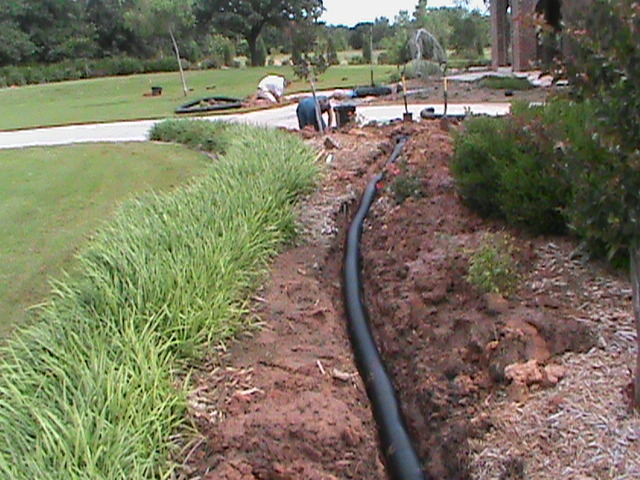 Oklahoma City Sprinkler Installation – French Drain – Sprinkler Repair, Blanchard, Newcastle.